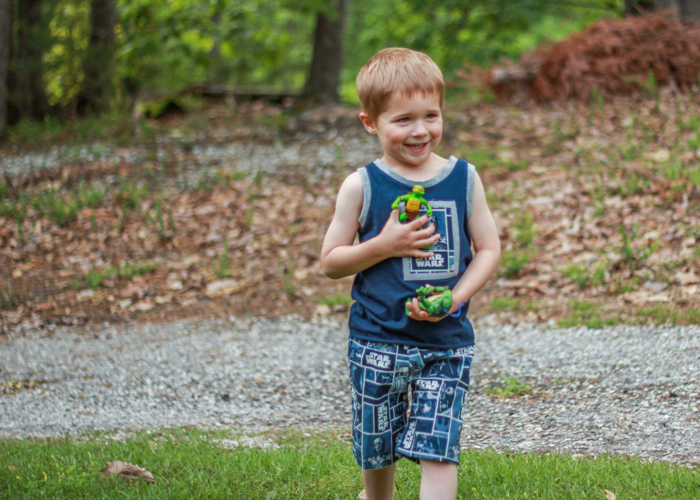 I’ve got one last Kid’s Clothes Week make to share with you- bringing my total makes this week to 4 pairs of shorts, 1 tank top, and 1 button down shirt. I had one more button down shirt that I was hoping to get to this week, but that was pretty ambitious so I’m not bummed to have skipped it for now . I’m just happy with how much sewing I was able to squeeze in this week! 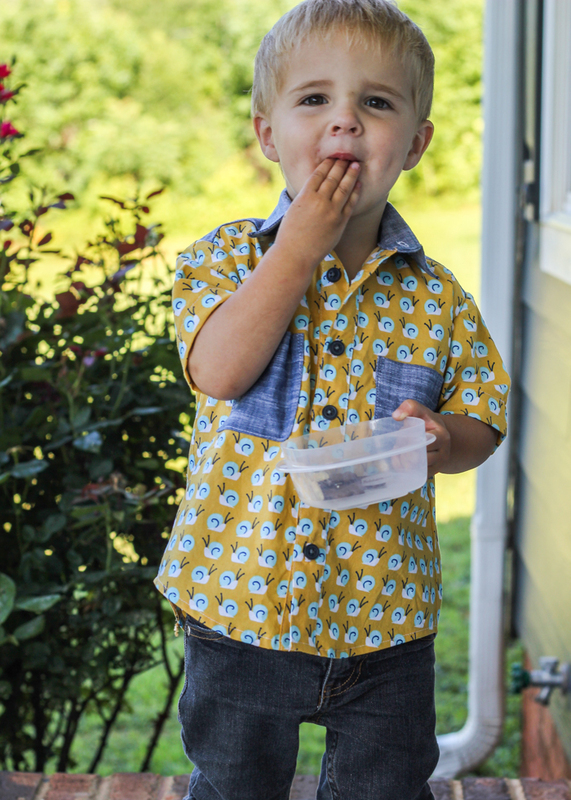 This is an Oliver+S Sketchbook shirt (guess I was on a roll with that pattern) in a size 2T for Eliot. 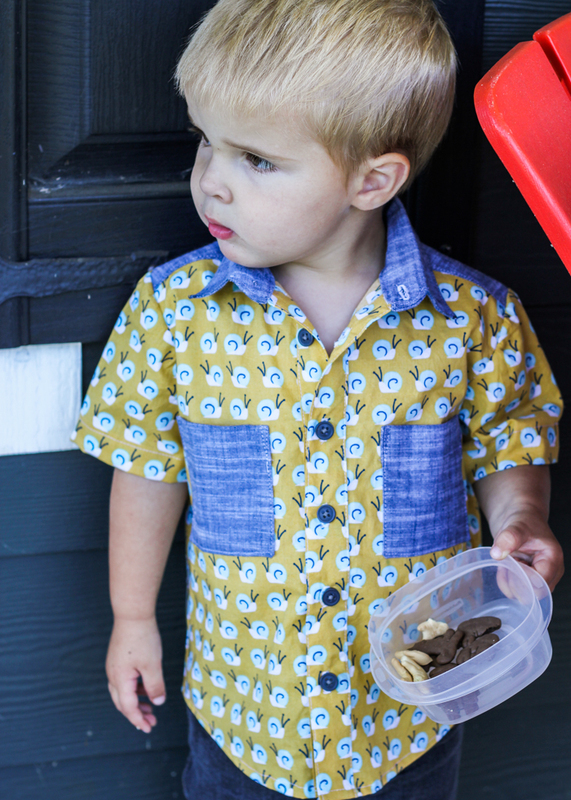 Timing wise this worked out well for me because I made Oliver a sketchbook shirt in 2T last spring for Vintage May (blogged here) and so all the pattern pieces were traced out already. Woot! This shirt is about as complicated as the shorts are easy so it was a huge bonus to have the pieces traced- about 7 or 8 of them in total, I think. 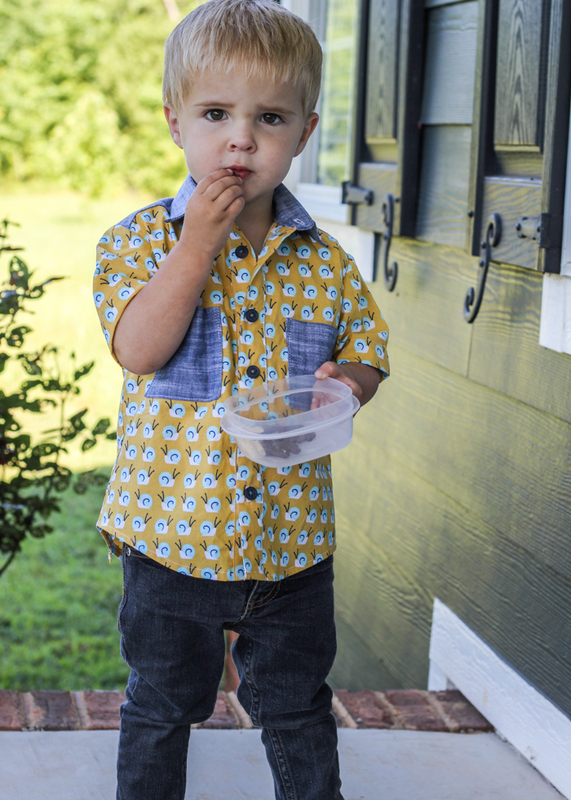 I’m not normally a short sleeve button down person but I think it’s pretty cute on little boys. Plus I’m so not motivated to do all the sleeve placket/cuff work of a long sleeve for a shirt that will be grown out of within a year’s time! I’m not a completely crazy sewing mom. lol. Even with the short sleeves, I had a time of it with those sleeves! I don’t normally struggle with sleeve easing, but I ended up with quite a few puckers this time. In the efforts of not being a perfectionist and also not having any more time to mess with it, I left most of them alone and hope no one will be looking closely enough at his shirt to notice them. Snail fabric is from Rae’s Lotus Pond line for Cloud9. (not sure where I bought this but I found some at Fabric.com) I’ve been saving this fabric for this very shirt ever since I saw Jessica’s version…a long time ago! Side note- we miss your blog and Film Petit very much, Jess (not that she’s reading this but I think Kristin is so I’m speaking to you too 😉 )!! 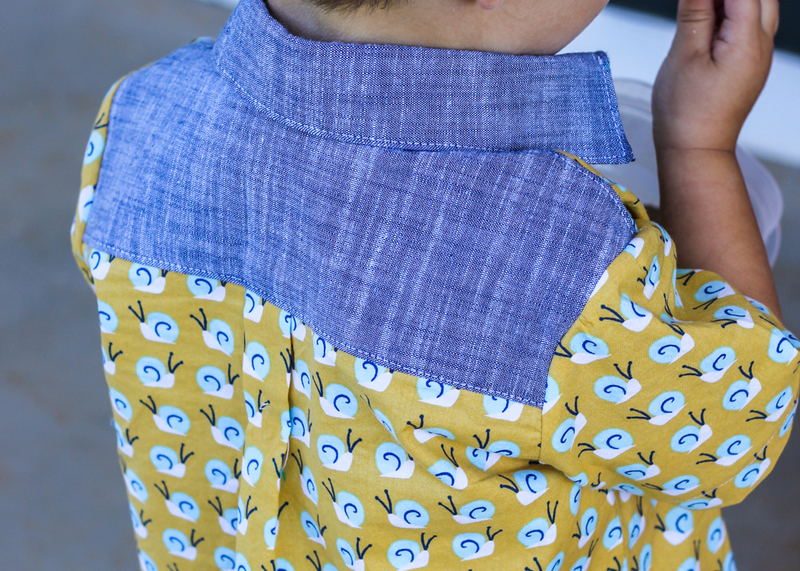 I was just going to make the shirt straight snails, but as I was cutting it out I had the idea to add some chambray for a bit of contrast. The chambray used is double cloth and quite a nice weight (cannot for the life of me find a link to the exact fabric-sorry)! I wavered back and forth on exactly what pieces to make contrasting and ended up going with the collar, yoke and pockets in the chambray. I posted a picture of my progress on Instagram and was blown away by how much love this little shirt got. Thanks to all my IG friends for bolstering my confidence because I had a moment of self doubt as to whether the final project was actually any good or not. Love my supportive IG community!! I’m back with another pair of sketchbook shorts to share with you. I know, I’m totally a broken record sometimes, but when you find a good pattern, you gotta squeeze the life out of it. 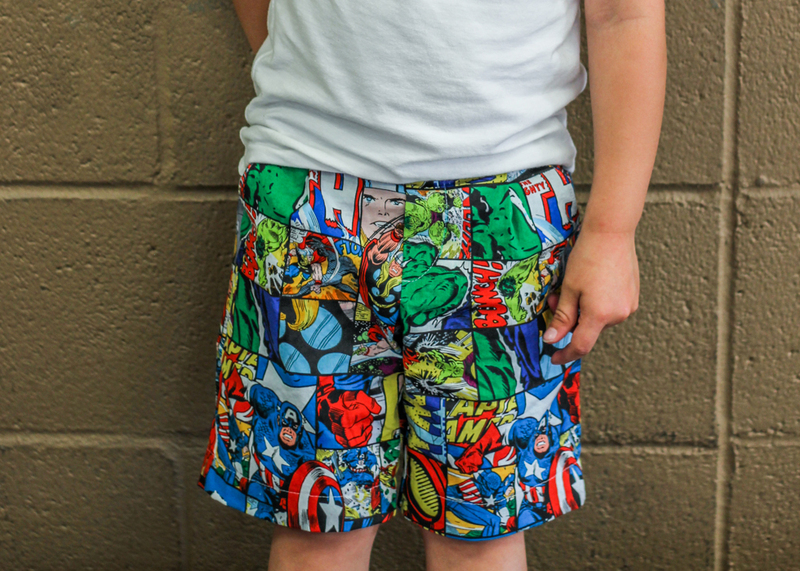 I have been seeing superhero shorts around the internets for the last few weeks (check out these from Jane and then Tara’s got a great pair unblogged but you can find them on her instagram- @girllikethesea) and just knew the boys would love a pair for themselves. I took them to our local Joann and let them pick out the fabric they wanted and then I got to work. I used the same mods as the last version- blogged here. 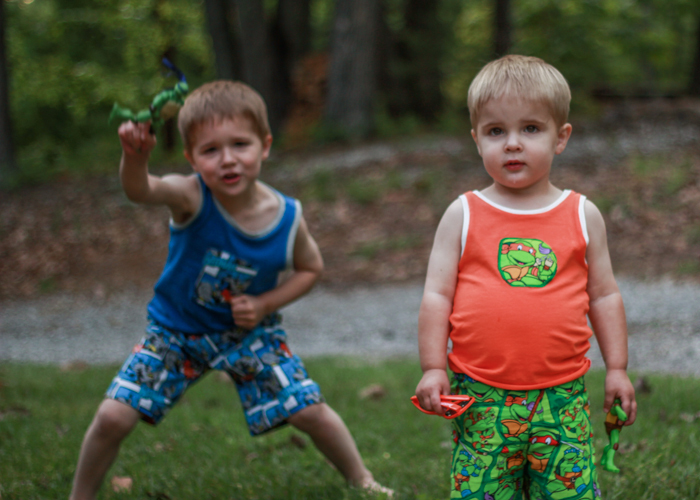 To recap: Oliver’s wearing a 3T and Eliot a 2T- with about an inch cut off his length. 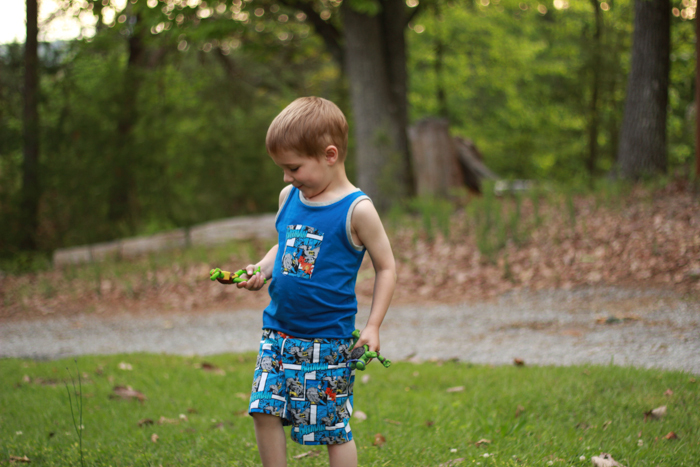 When I finished the shorts, Oliver decided he HAD to have a matching shirt. 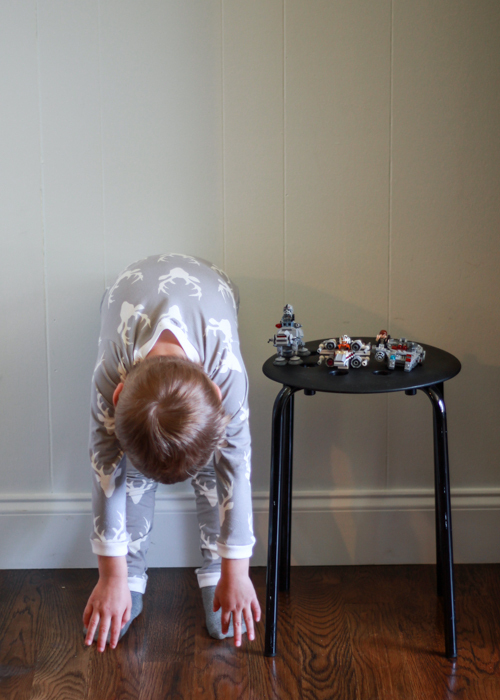 I wasn’t sure exactly what he meant until I realized he wanted something similar to the superhero pajamas I made him a while back. Because I’m a super nice mom 😉 , I decided to humor his request. 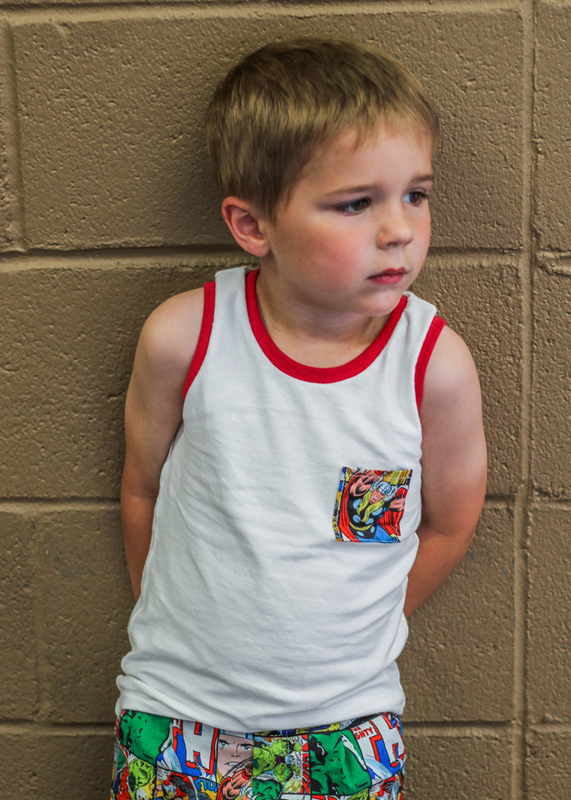 We decided upon a white tank with a superhero pocket- he was very specific about the need for the pocket. The white (PDF to be specific) is more Kaufman laguna jersey. It’s the only color I have left actually so I’ve got to stock up on some more! I had this red ribbing that coordinated nicely with the superhero fabric so I used that to bind the arm and neck holes. I used the Titchy Threads Twisted Tank again for the tank top. Can’t say enough good things about how awesome that tank pattern is. Very highly recommend it. And I still have yet to try the twisted version but it’s on my to-do list! 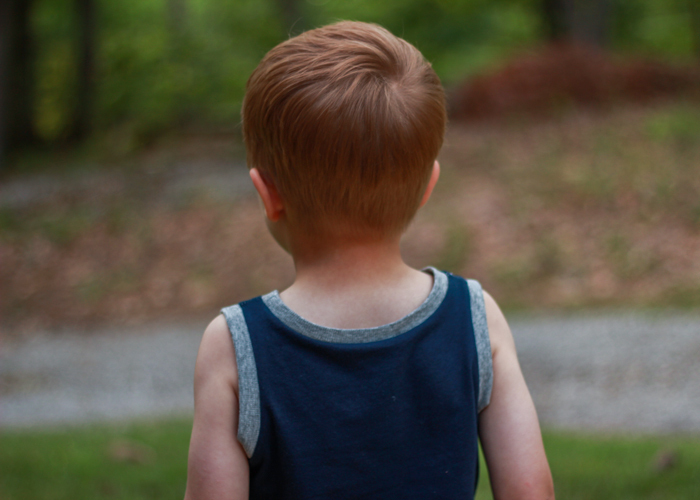 Eliot did not get a tank because I ran out of time…and that’s totally unfair, I know, but being the less verbal child does have its drawbacks… His tee is an old up-cycle I made for Oliver way back during a long time ago Kid’s Clothes Week. My next KCW project is not shorts- imagine that 😉 but the week’s end is coming so quickly I’m afraid I won’t get to it! I’m going to start plugging away at it during nap time today though so we will see how much I can get done! Oh and I totally forgot about Rachael’s Shorts on the Line sew along going on, but head on over to Kollabora to view all the awesome shorts being made and link up your own if you have some. Quite serendipitous that I just happened to be in a shorts mood during all that! Don’t forget the Kid’s Clothes Week project pool either! 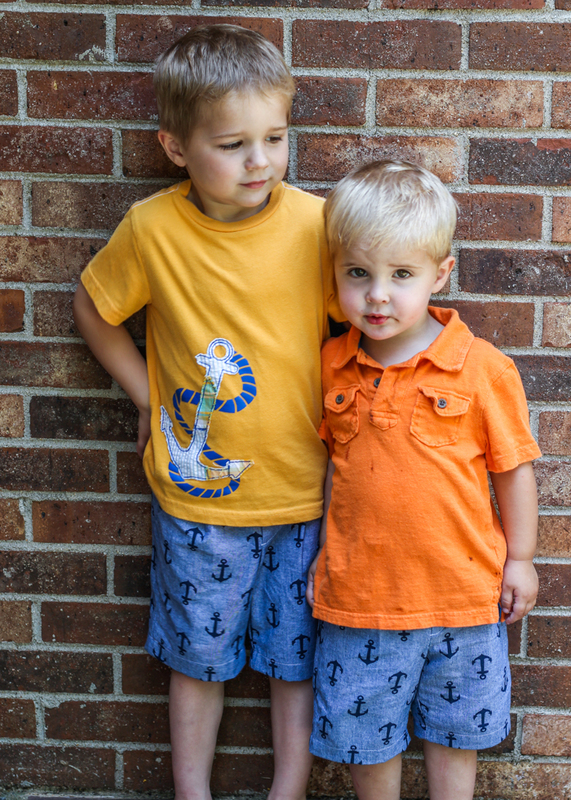 I used Dana’s Kid Shorts Made pattern for the bottoms. 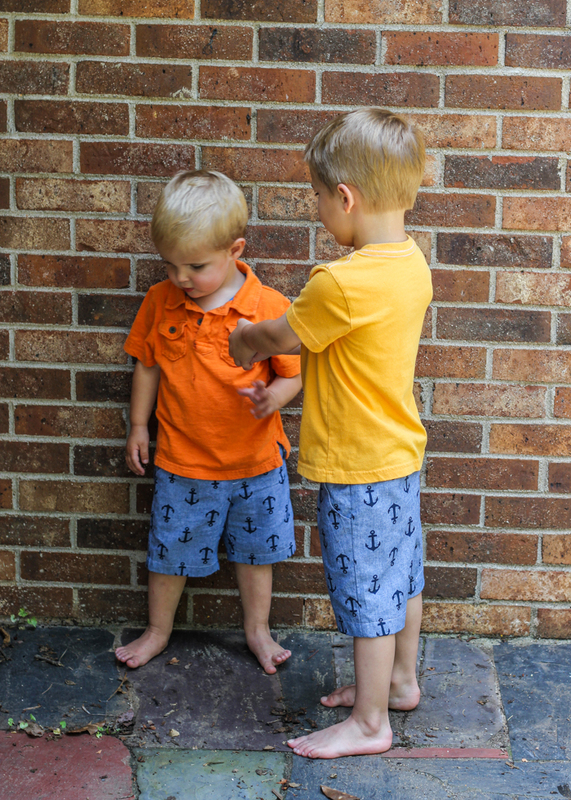 Eliot’s shorts are 2T and Oliver’s are 4. Oliver’s fit pretty perfectly with enough room to grow over the summer. 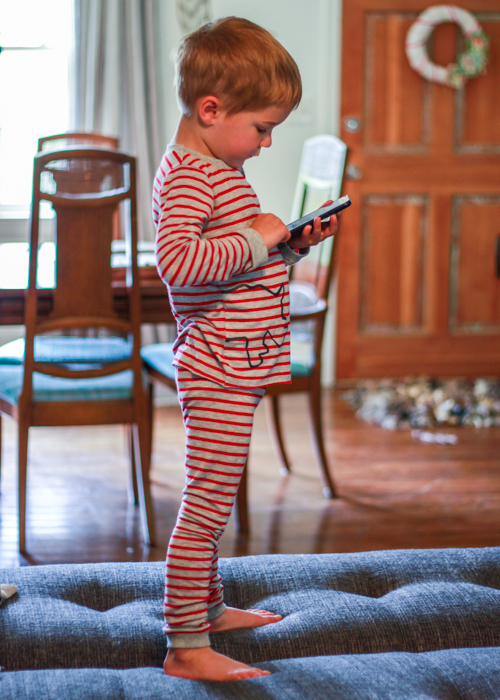 And Eliot’s fit great with the disposables he wears to bed but are a little snug with the cloth diapers that he wears during the day. Since he’ll be wearing these to bed, that’s not a big deal, but it’s something to keep in mind if I make him any for day wear. The tops are the Flashback Skinny Tees. 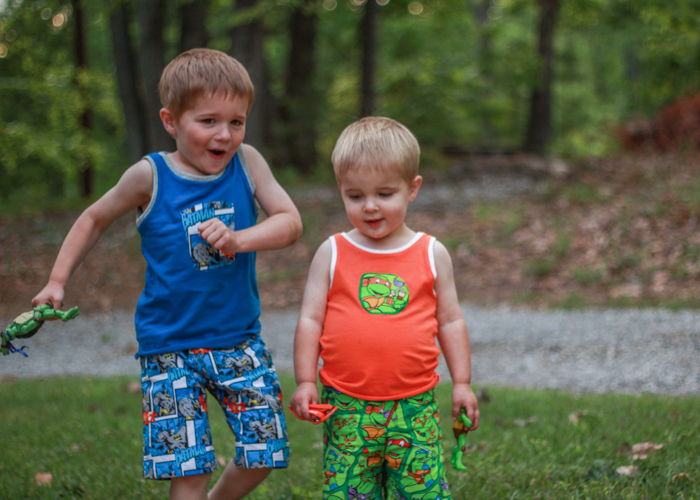 I looked up the tanks I made for the boys last summer (blogged here) and used the same mods. To sum it up- I cut 3/4″ off the arm holes and deepened the neckline in the front and back a bit. I cut the neck and armhole binding 1.5″ wide instead of 2″ like the pattern recommends. Oliver’s is a 4 with a little length and width added to make sure it fits through the summer. Eliot’s is a 2 with just a little extra length. All three of the tanks are made from Robert Kaufman’s Laguna jersey. I love having this on stock for last minute tees. The orange is from fabric.com and the blues are from Imagine Gnats. 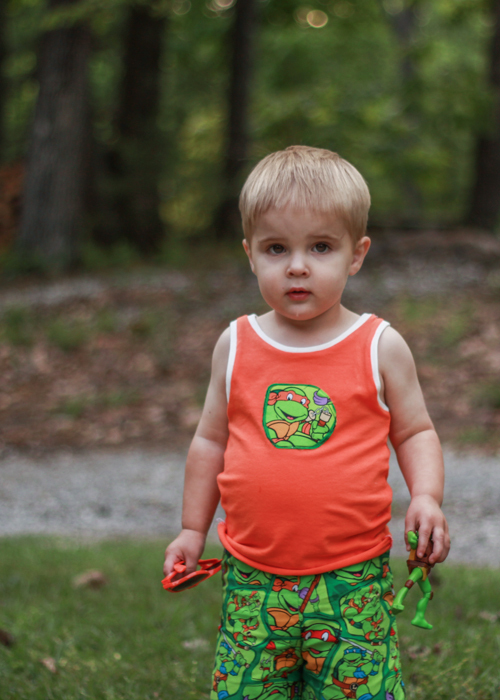 I had some fabric scraps left from the shorts and appliquéd them to the tanks for a little fun addition. Once I was finished with these tanks, I realized that I actually own the Titchy Threads twisted tank pattern so I am looking forward to trying that one out later this summer on some other projects I have in mind and comparing that version with my FBST hacked version. But with this, I’m done with pjs for now! The boys should be set through the end of the summer. On to non-nightime related projects. 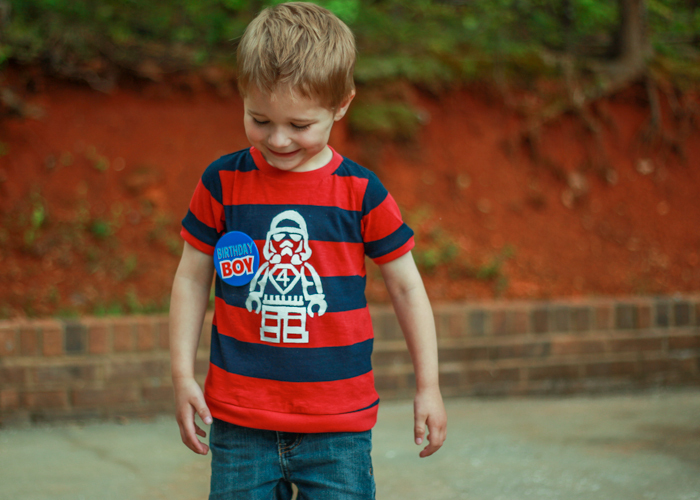 Oliver turned 4 today….sigh. 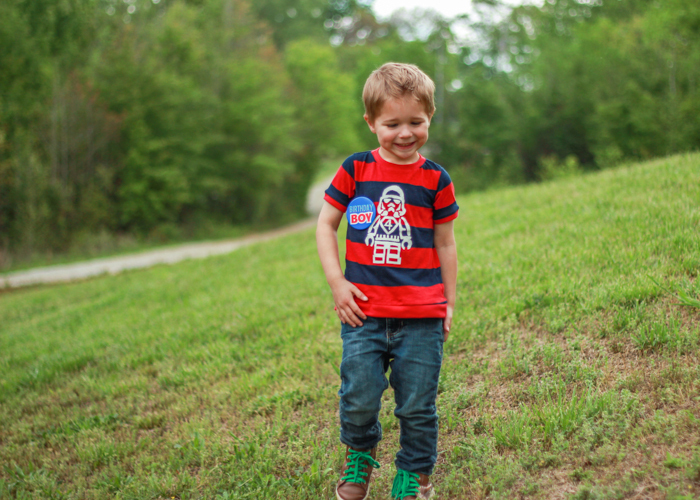 On the one hand, it feels like I’ve been a mom forever, but on the other hand, it feels like just yesterday he was a teeny little baby. Four is just such a big kid age! 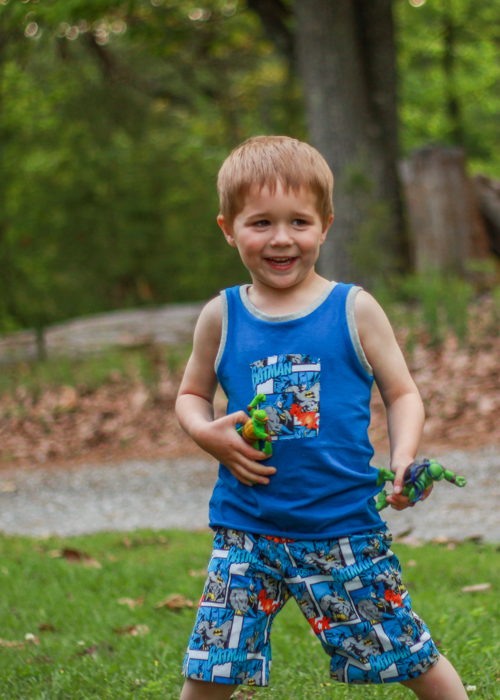 And while I really am excited to get to enjoy all the fun that comes with the big kid stage, I’m mourning just a bit the loss of my little toddler. 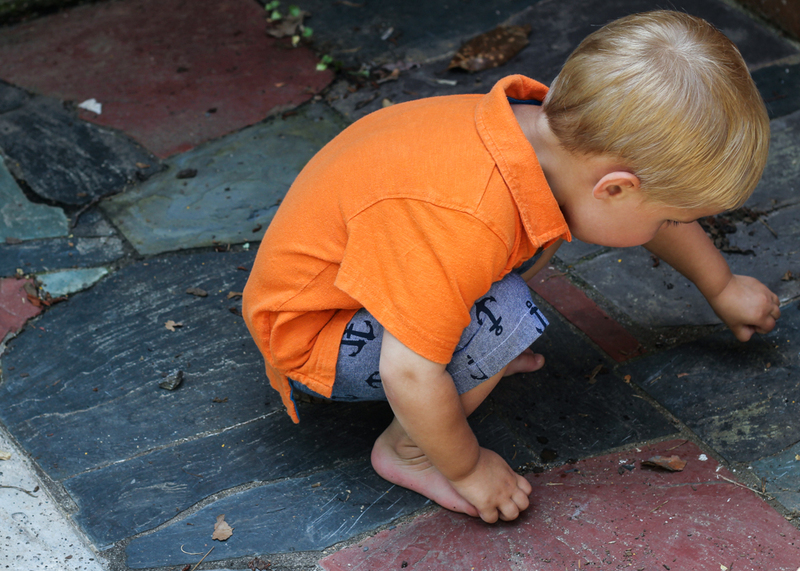 Okay, enough sentimentality, on to some crazy cute pictures of this kid. 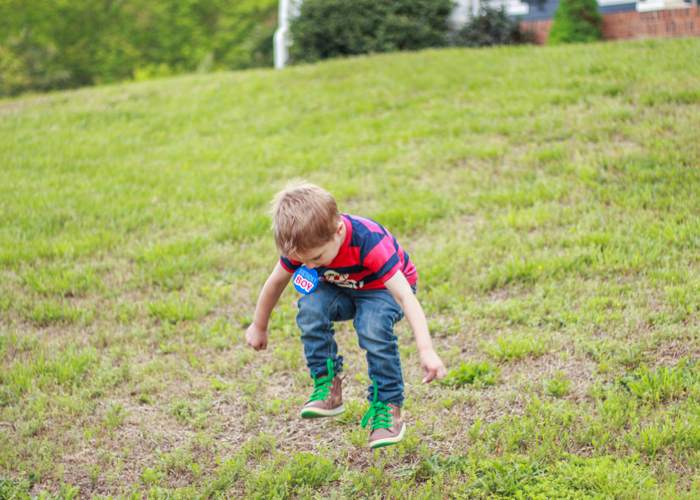 Can you tell Daddy was around to take pictures today? Yeah, maybe one day I’ll have his photog skills. The birthday shirt is a tradition around here. And like all good traditions, it’s always made the night before the birth day itself. 😉 In the past, I’ve done mostly traditional number shirts. You can see my previous ones here (three, two, one), but this year I wanted to do something different. Something that would mesh into his every day wardrobe a little easier. So I consulted Oliver, of course. 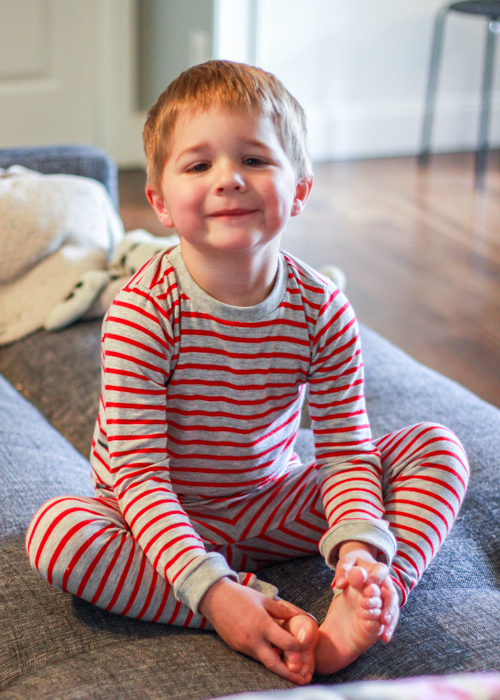 He picked out this navy and red striped knit from my stash for the fabric. (bought on a recent trip to Charleston where I stopped in at Five-Eigths Seams and raided their knit stash. Unknown substrate info except it’s a lightweight jersey knit that feels like mostly cotton with maybe a little bit of spandex). I searched the internets for birthday number tee ideas until I came up with several options for O to choose from. 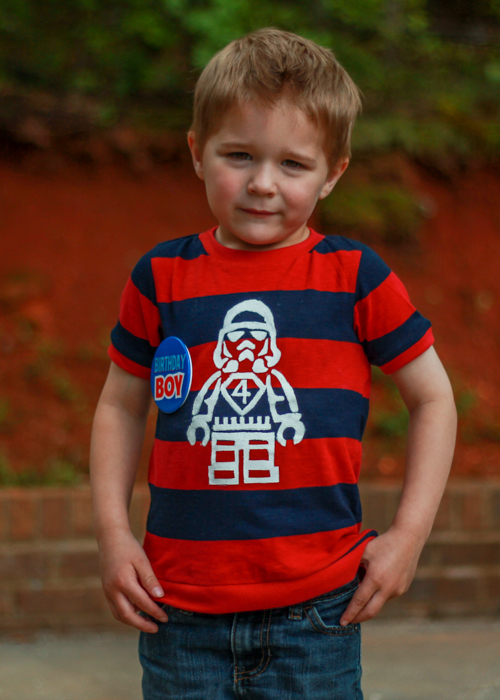 He, of course, wanted all the options so we decided to combine the superhero shirt with the stormtrooper. I used a free stormtrooper printable (found here) and added Superman’s logo to the chest along with the 4. It might not be super obvious that it is a Superman logo, but Oliver gets a kick out it so that’s what counts. The stormtrooper is freezer paper stenciled onto the shirt. Cutting out all those pieces was a bit tedious but I really like the end result. Note on freezer paper stenciling: less is more. I put my paint on a little too thick and the stencil didn’t come off very neatly, so I had to go back with a small brush and touch up a bunch of spots. Ended up being fixable but wouldn’t have been an issue if I had used thinner layers to begin with. 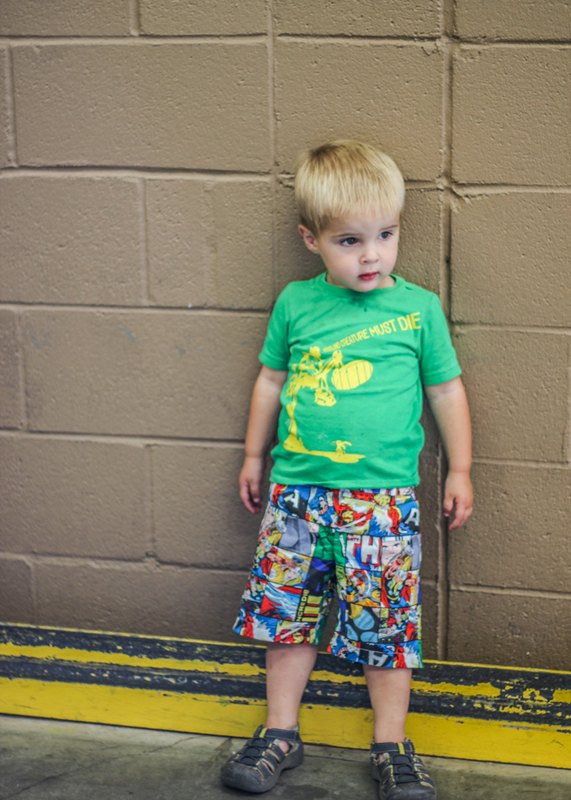 Pattern is the flashback tee in a modified size 4. I wanted it to be a little looser fit so I added about 1/4″ to the width on both sides when I was cutting it out. I wasn’t thinking and cut off some of the bottom hem to even out the stripes and ended up cutting off too much and making it too short. So I used the same rib knit that I bound the neckline and armholes with and made a binding for the bottom hem. It’s not my fave hem but at least it’s not too short! I must admit to being pretty happy with how well the stripes matched up on the sides and the sleeves! 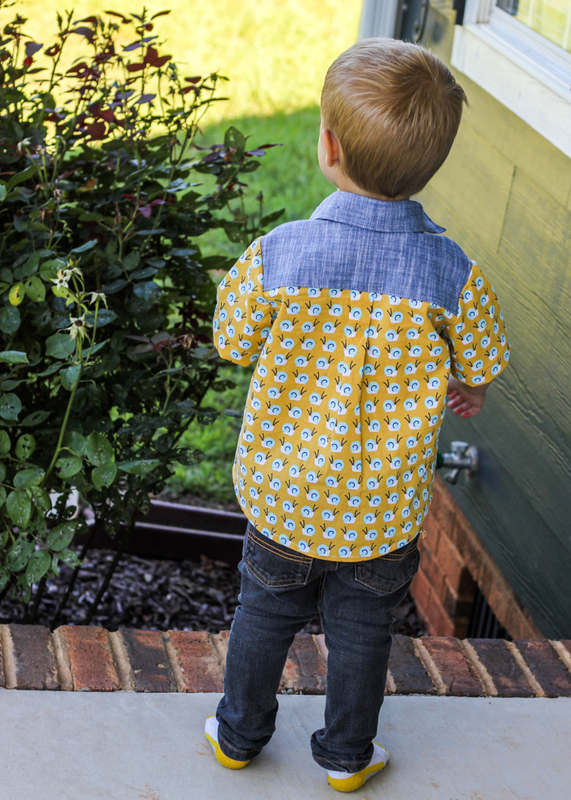 The entire shirt was sewn with my serger so it was a pretty quick sew- made up for the time-consuming stencil. And that wraps up a pretty successful Kid’s Clothes Week. I don’t always get to whole heartedly participate anymore, but I really enjoyed getting into my sewing groove this week and cranking out a bunch of stuff. I’ve got a few more things to show you next week after I put the finishing touches on them. I’m back with another pair of pjs for Oliver. This pair is basically the exact same at the previous pair except for different fabric and the rhino addition. I bought this jersey knit from Imagine Gnats at the same time I bought the deer fabric. 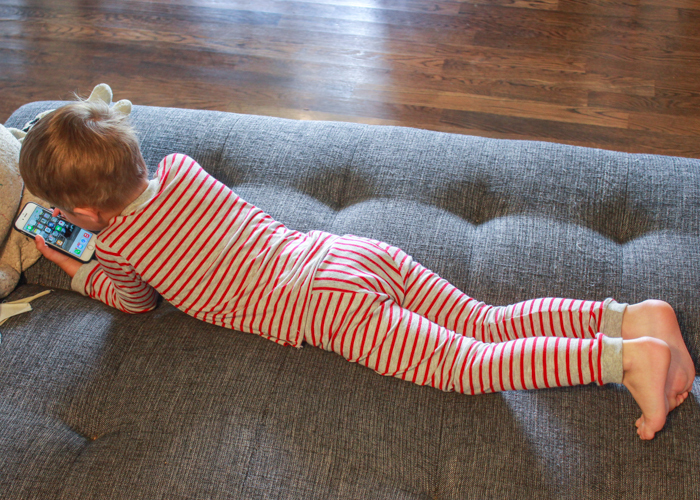 She has a great selection of stripes, and I had Oliver look through and decide which stripes were his favorite. I would not have picked the red and grey for him but he loves it. Again, flashback skinny tee in a 4T for the top. Coordinating grey ribbing for the neck and sleeve bands. I have yet to hem this version either. 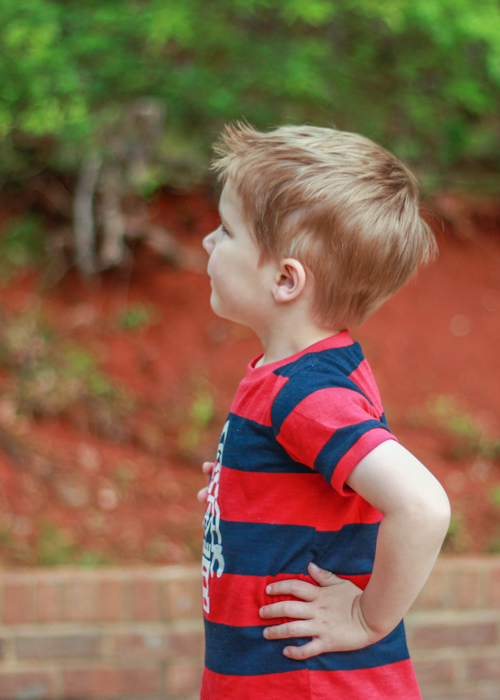 My husband just asked me why I never hem the knit tees….ummm, because I’m lazy? lol. 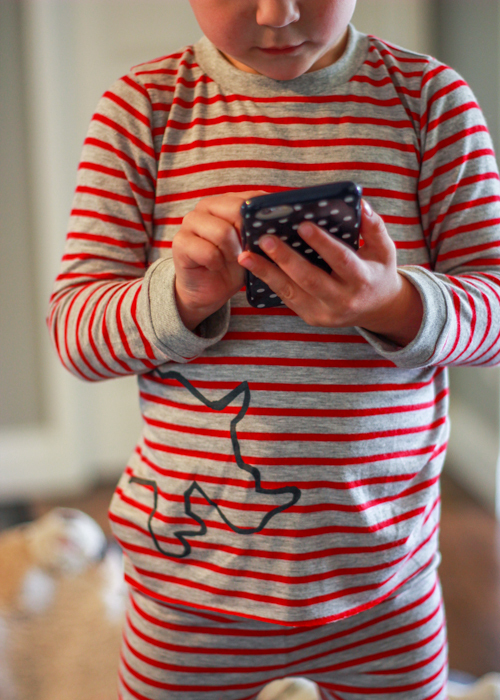 I wanted to have some fun with the “wild things” theme for kid’s clothes week so Oliver and I brainstormed different animals until we decided upon a rhino for his shirt. I decided to keep the rhino understated so I just freezer paper stenciled the outline in black fabric paint. I can always go back and fill in the outline if I decide it needs more substance. What do you think? Is it good as-is? Pants are the fancy pants leggings, yet again. 4t. I used 1.25″ elastic in the waistband this time, and it fit perfectly and gives the waistband some nice structure. For added fun, I rotated the stripes in the bum panel. 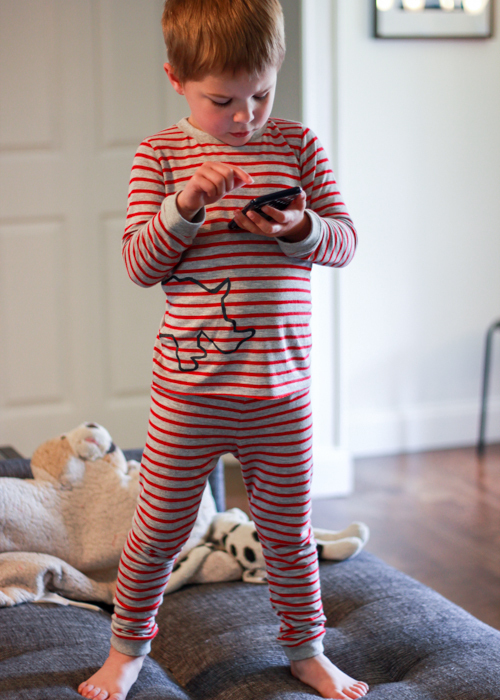 Oliver’s first comment when trying these pjs on was “these are so cozy”. Score! I think the extra cozy factor is due to the rayon in the jersey. I normally just use cotton/spandex blend jersey but went out on a limb to try the rayon blend this time. It’s a little more slippery to sew with and quite drapey, but once sewn together I was pretty happy with it. In case you haven’t noticed, we are going super simple on the photo shoots this week. KCW is all about sewing, and that means less time for shoots, so hope the less-than-stellar photography doesn’t bother anyone. 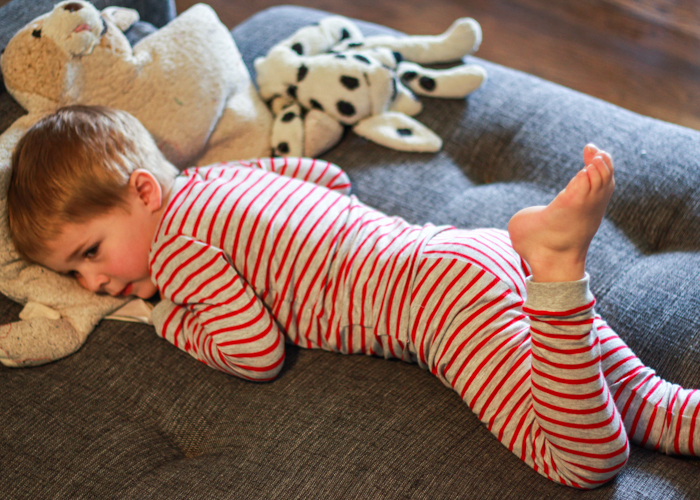 Plus, photo shoot with pjs need to involve comfy couches and doggie pillows, right? Hope your kcw sewing is going well. 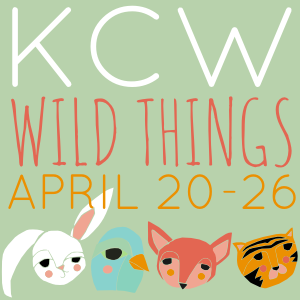 I’m loving all the “wild things” I’ve seen so far and am excited we still have 3 more days to go. Next up on my list are some more pjs- but this time summer versions with tank tops and woven shorts…so I am switching things up just a bit. 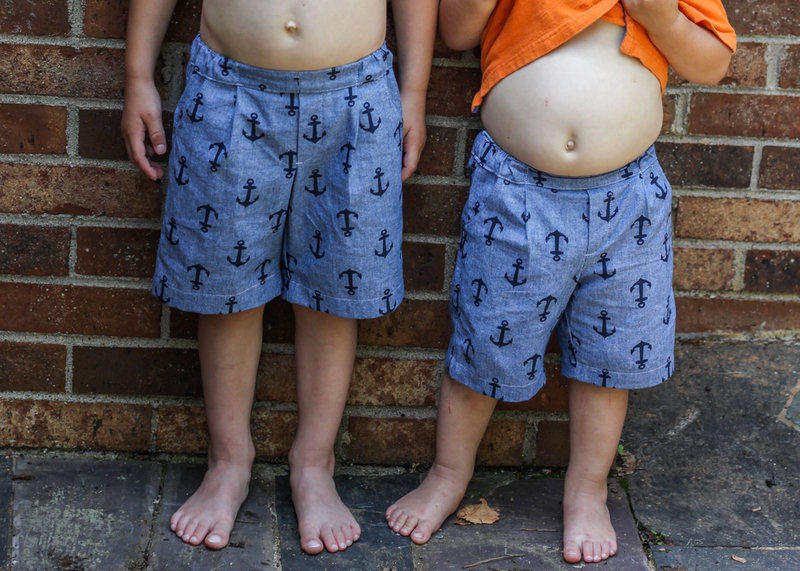 😉 Can’t wait to show you the fun fabric the boys picked out for these! So far I am on a roll this kcw! Eliot has been taking good naps and Oliver is actually spending an hour all by himself for his quiet time! Whew. I have no idea how long this will last so I’m taking full advantage of the sewing time while I can! Today’s project was one of several pairs of pjs I have planned for Oliver. 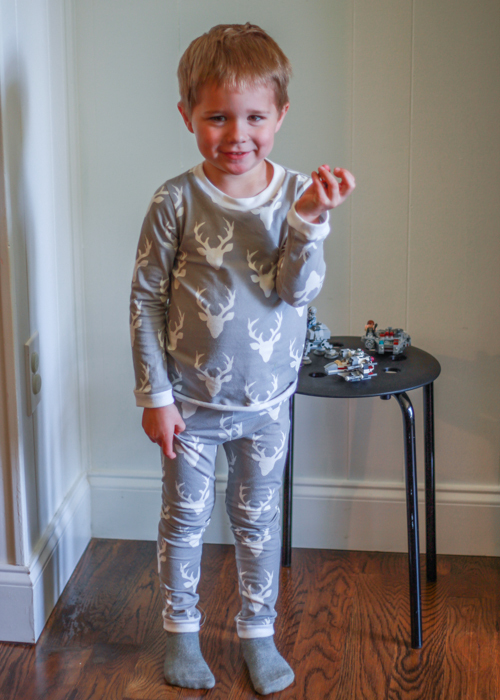 These pjs are made with some Art Gallery Knit (Hello Bear by Bonnie Christine) that I picked up during Imagine Gnat’s spring break sale. 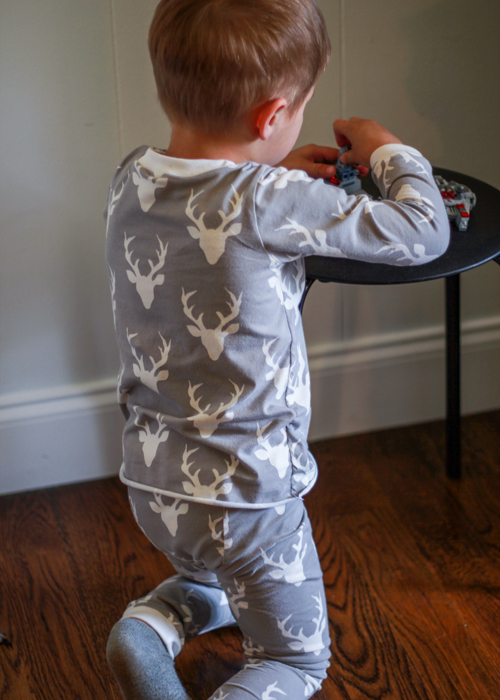 I had Oliver go through the shop’s knit selection and pick out a few prints that he would like for pjs- again, part of my plan to make sure my handmades get worn! I was able to squeeze of these garments from one yard of fabric- love sewing with wide knits. Even with the bit extra priciness of AGF knits, this comes out as a pretty thrifty outfit. Tee pattern is the good ol’ Flashback Skinny Tee from Made by Rae. 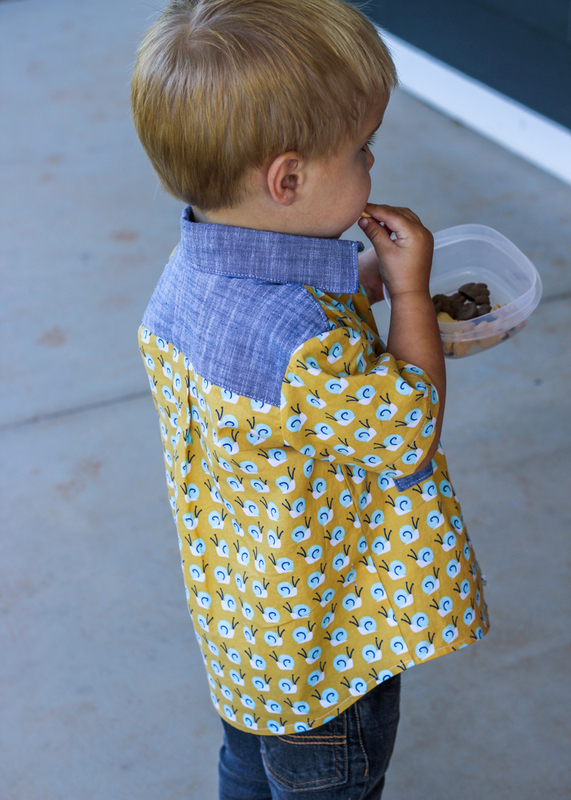 I made a 4T and it fits pretty perfectly. I just realized only have one more size till I size out of my pattern. Going to have to get the larger sizes one soon. Hard to believe my little baby is getting that big. Wah! Oh also, I was going to hem this but I used my serger for the entire construction and was too lazy to change my sewing machine needles and thread for hemming so we’re sticking with the un-hemmed look for now. It’s in, right? 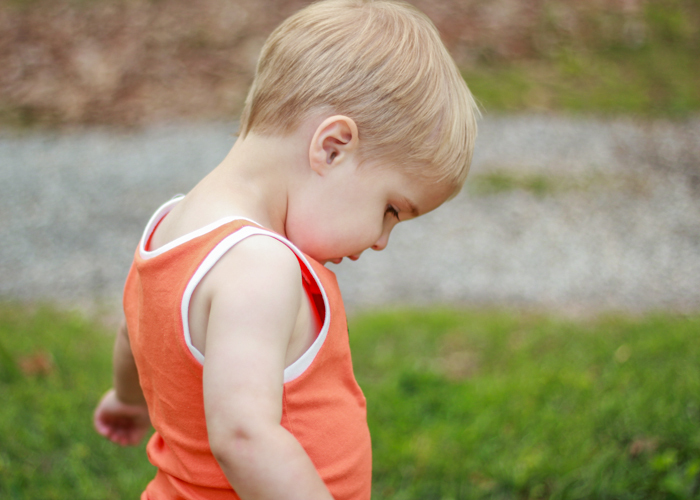 Bottoms are the fancy pants leggings from Laura at Titchy Threads. 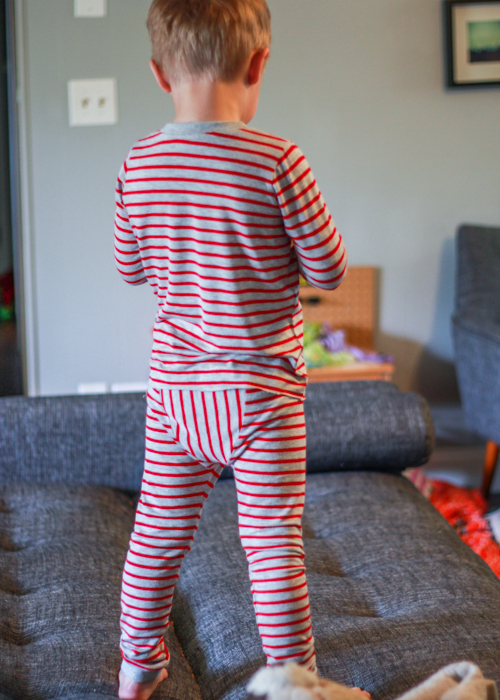 I thought about trying to find another legging pattern for the bottoms since I didn’t necessarily need the bum panel for these pants, but I already own this pattern and had the 4t size traced and ready to go so I just went with them. Even without using contrast fabric, I do think that bum panel is pretty cute. My ribbing is pretty thin and doesn’t have great recovery so I inserted some 1″ wide elastic in the waistband to help the pants stay up. 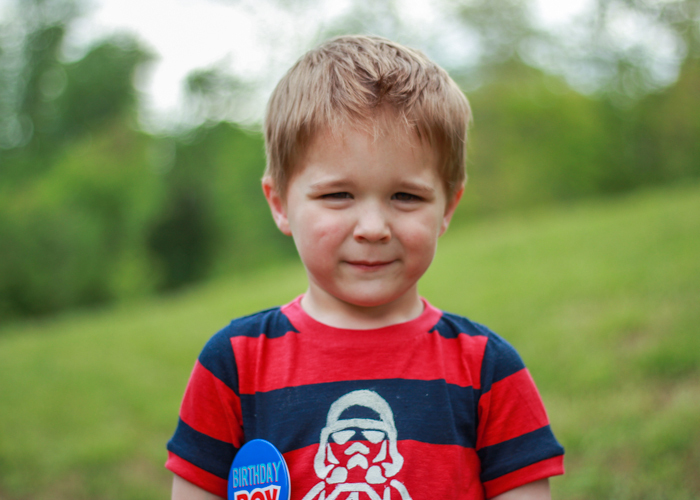 Oliver requested taking pictures with his daddy’s new Star Wars lego mini fighters. The boys and I picked them out for daddy’s birthday last week and we are all enjoying them. 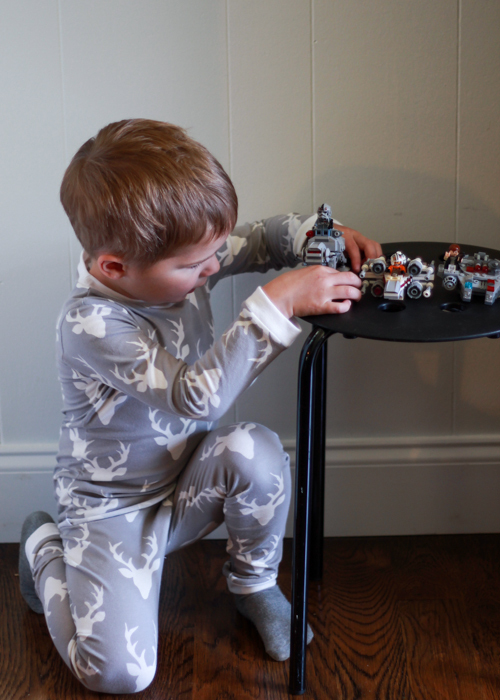 The mini AT-AT is so stinking cute, I might steal it for myself. 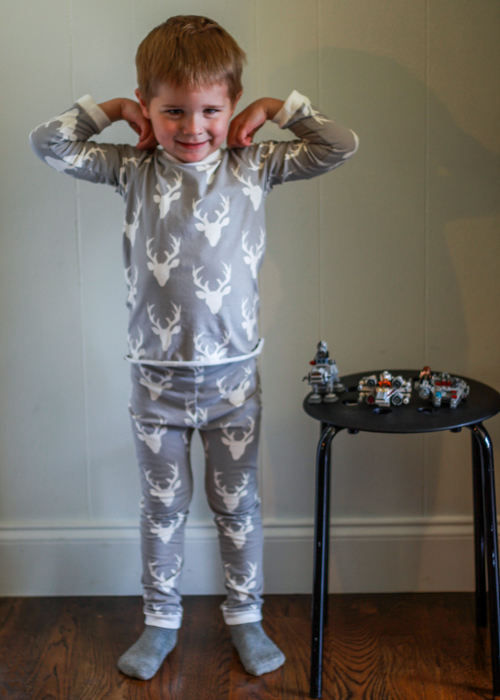 Anyway, these pjs might be a bit of the easy way to fit into the wild things theme for this week, but hey, Oliver picked the fabric himself so can’t blame me. 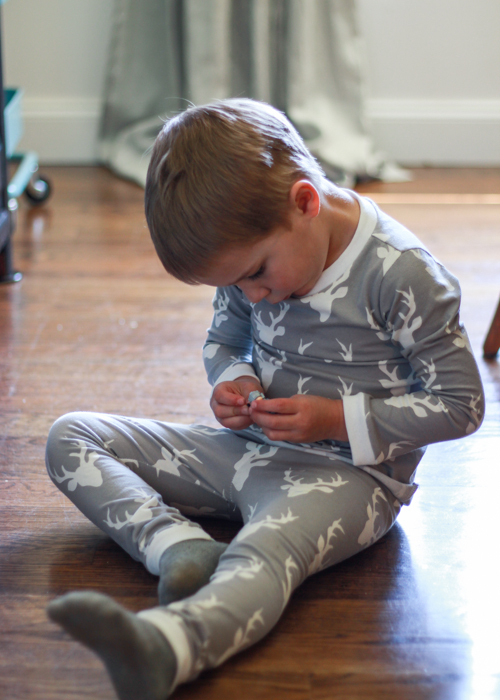 I’m hoping to have some fun with fabric paint and wild things on another pair of pjs later this week. Fingers crossed for continued good sewing time!